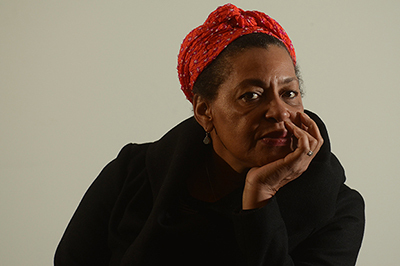 Award-winning artist and storyteller Carrie Mae Weems will be the next guest of the University Lectures Series on Tuesday, Oct. 28. Weems will share her work and the stories that inspired it during her presentation, “Swinging into Sixty: A Woman Ponders the Future,” which begins at 7:30 p.m. in Hendricks Chapel and is free and open to the public. This lecture is sponsored in cooperation with the College of Visual and Performing Arts, University College and the Humanities Center as part of the 2014 Syracuse Symposium: Perspective. Reduced-rate parking is available in Irving Garage; American Sign Language (ASL) interpretation and Communication Access Real –Time (CART) will be available for this lecture. Over the past 25 years, Weems has worked toward developing a complex body of art that has at various times employed photographs, text, fabric, audio, digital images, installation and video. She has investigated family relationships, gender roles, the histories of racism, sexism, class and various political systems. “Despite the variety of my explorations, throughout it all it has been my contention that my responsibility as an artist is to work, to sing for my supper, to make art, beautiful and powerful, that adds and reveals; to beautify the mess of a messy world, to heal the sick and feed the helpless; to shout bravely from the rooftops and storm-barricaded doors and voice the specifics of our historic moment,” she says. Storytelling is fundamental to Weems’ work. Her works include “Family Pictures and Stories,” “Ain’t Jokin,’” “Colored People” and the “Kitchen Table” series. Throughout the 1990s, she explored the African diaspora through “Sea Islands,” “Africa,” “Slave Coast” and “Landed in Africa” and “From Here I Saw What Happened and I Cried.” In 1997, Weems began a trilogy of large-scale fabric installations that resulted in “Ritual & Revolution,” “The Jefferson Suite” and “The Hampton Project.” Other works include “The Louisiana Project” and “Coming Up for Air” (2004). Weems has won numerous awards for her work, and her talents have been recognized by numerous colleges with fellowships, artist-in-residence and visiting professor positions. She was awarded a MacArthur Foundation Fellowship in 2013. “Carrie Mae Weems: Three Decades of Photography and Video,” a 30-year retrospective of her work, opened in January 2014 at the Solomon R. Guggenheim Museum in New York City. The Office of University Lectures welcomes suggestions for future speakers. To recommend a speaker, or to obtain additional information about the University Lectures series, contact Esther Gray in the Office of Academic Affairs at 315-443-2941 or eegray@syr.edu. More information can be found on Facebook at http://facebook.com/home.php#!/universitylectures. The last lecture of the fall 2014 semester will be given by Barry Scheck, attorney, DNA expert and co-founder of the Innocence Project (Nov. 11). Presenters during the spring 2015 semester include big data expert Andreas Weigend (March 3); WNBA president and marketing expert Laurel Richie (March 18); and photojournalist Annie Griffiths (March 24).